Wow! This guy gets around! -December 21 issue of Billboard Magazine. -M, Popstar, BOP and Girls Life Magazines all available in May! ---Check out Stevie in a live voice chat on his yahoo ST. Kristin and Lydia will post when it is so check often! ---Stevie is constantly being featured in Teen Magazines so check your local retail store and hunt through those mags for Stevie!! -Listen to Stevie on track #3 "The Boy Next Door" on Triple Image's album "Celebrate" in stores now. -Watch Stevie in "The Last One Standing" video by Triple Image. -Stevie's single "All For Love" can now be heard on Radio Disney! -Check out the "All For Love" video on AOL Kids Only! 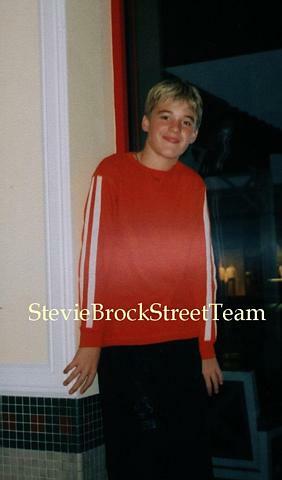 -Vote for Stevie in the poll "Aaron Carter VS. Stevie Brock. Who is the ultimate pop prince?" You can vote on the Kids Only Music Section! -Stevie's commercial to buy his cd, and get a free poster and video with your order can be seen on Nickeloden and ABC Family! -Stevie is now featured on Radio Disney's Jams Volume 6 CD! -Be sure to get the chance and talk with Stevie on one of the LIVE street team chats. If you are not a member, be sure to join!